I am guessing that most of our readers have played basketball at some level, and those that have remember vividly those opponents that, when you made contact with them, you came away saying, "That guy is built of granite!" 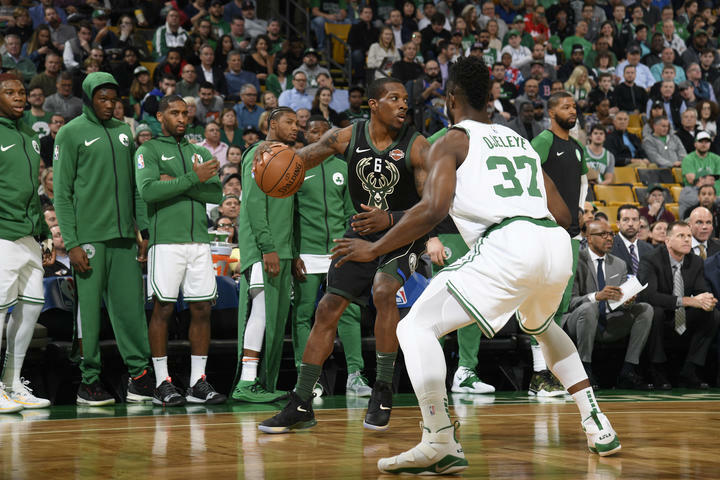 In an interview with GQ Magazine, the Celtics Semi Ojeleye gave his thoughts on workouts, nutrition and the three NBA players that have strength comparable to his. I still help build physiques, even my own ancient carcass, and trust me - Semi is muscular and ripped. He was measured at the Draft Combine at 5.50% body fat, and with the muscle he carries, he is chiseled. He is listed at 6'7" and 241 pounds - but looks lighter. That is one measure of a lean, muscular physique - a person looks like they weigh less than the actually do. Shultz: Is there an NBA player you’ve gone up against who made you say, “Wow, that guy is definitely stronger than me?” If you can’t come up with any names, I’m going to assume you think you’re the strongest player. Ojeleye: I’ll say Giannis (Antetokounmpo) and LeBron (James). Those two dudes have been a tough matchup. Joel Embiid too. I ran off a screen against JoJo, hit him, and almost got hurt. I thought, Next time, I’m going around. But I don’t think I’ve ever been up against a guy where I’ve thought, Man, I just can’t handle this. You can bet opponents feel the same just-ran-into-a-concrete-wall reaction when they make contact with The Ox. He is solid, lean, strong and a tough defender. He still needs to work on his offensive game, but he looks like a keeper for the Boston Celtics.